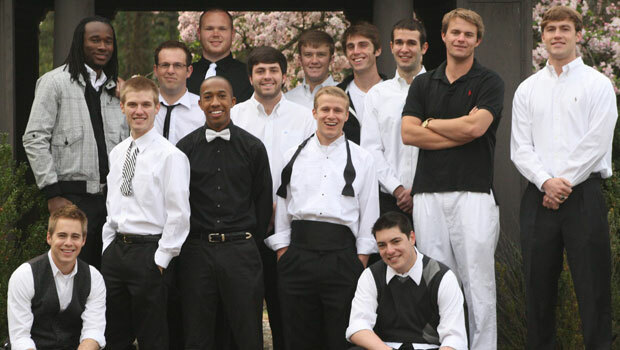 For 19 years, Chi Rho, Wake Forest’s men’s a cappella group, has been entertaining the community — performing contemporary Christian, pop, rock and traditional hymns using only their voices. The student-run and directed ensemble has toured nationally and internationally — releasing 11 albums since 1993. Chi Rho’s award-winning vocalists have been featured on “Voices Only,” a compilation of the best college a cappella groups in the nation. Senior John McDonald talks about the group and the release of their latest recording. Chi Rho and “Glee,” any similarities? I love Glee, as do a number of the Chi Rho guys. I get a lot of flack for it — but the music is, most of the time, pretty killer, which is why I watch it. Thankfully, we do not have nearly as much drama as the kids on Glee, but I would add that the diversity in Chi Rho (classes, majors, interests, walks of life, etc) is about as scattered and eclectic as the Glee-ers. We’ve always prided ourselves on this. Big Concert will be held in Wait Chapel on Saturday, April 16 at 8 p.m. The event is free and open to the public. “In Reach” CDs will be available for purchase at the Big Concert, in the College bookstore and on amazon.com. What is the most challenging part of singing a cappella? Staying in rhythm and tune – having 14 guys all totally synced up is a pretty challenging task. How do you recruit new students? We reach out to first-year students in the fall as well as sophomores, juniors and seniors. We try to make the audition process as relaxing and fun as we can, but it is certainly competitive. There are typically 20-30 guys trying out for 3-4 spots. “In Reach” deals with God’s all-encompassing power and grace, and how regardless of where we are in life, we are always within his reach. What’s it like to record a CD? Chi Rho alumni, Derek West, is a fantastic producer in Nashville, and we have been using his studio and services for a number of years now. First, we have to select and arrange all of the songs. From there, we record for one week, have Derek mix the tracks, and then a few of us go back to the studio to polish up spots and add vocal fills. Some of the recording days are, honestly, exhausting, starting at 9 a.m., and going straight until midnight. Singing pretty much non-stop is one of the most tiring things I have ever done. Which song on the CD is the group most excited about? We are all pretty jazzed about “By Your Side” by Tenth Avenue North. The song itself is amazing, as well as the soloist, Connor Chick, but we managed to mix in Coldplay’s “Life in Technicolor,” and the combination is fantastic. I am excited for everyone to listen to it for themselves!